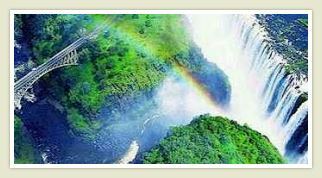 International flight from Johannesburg to Victoria Falls, which is on the border of Zimbabwe and Zambia, and available hotel accommodation may be either on the Zimbabwe side or on the Zambia side. After clearing customs, you will be met and transferred to your hotel. The rest of the day is at leisure to explore the quaint town of Vic Falls, or Livingston, Zambia, with local craft markets and a view of the Falls, or relax around the hotel swimming pool. Time permitting, you might want to partake in some adventure activities, which can be arranged at the hotel reception. Overnight on a BB basis. Enjoy a morning tour of Victoria Falls, beginning with the famous Livingston Baobab tree, thought to be about 1500 years old. Visit the museum for some information on the facts and figures of the spectacular natural wonder, considered by many to be one the world's largest and most spectacular waterfalls, also known as Mosi-Oa-Tunya, the Smoke that Thunders. View points are situated along the falls, so you can see Livingston Island, Devil's Cataract and Danger Point, to name a few. Return to town for some free time at the local craft markets. Zimbabwe and Zambia are well known for their stone and wooden handwork. Return to the hotel and at about 16h30, transfer to the Zambezi river for a relaxing sundowner cruise. Drinks and snacks are included. There is a good chance to see hippo and crocodile along the banks of the river, as well as elephant, buffalo and many aquatic birds. Morning at leisure - perhaps you would like to take a 15 min helicopter flip for some aerial views of the gorges and falls? 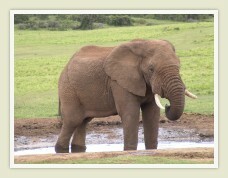 Transfer to the airport in time for your return flight to Johannesburg. 2 Nights accommodation (bed & breakfast). Guided tour of the Falls. Entry visa (please pre-arrange with your local travel agent). Please feel free to contact us if you are interested in this tour package or if you would like us to tailer make a package for you. 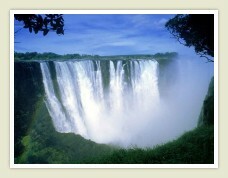 The Victoria Falls are waiting ..Book your tour now!